The Magnetoplasmadynamic (MPD) thruster (MPDT) is a form of electric propulsion (a subdivision of spacecraft propulsion) which uses the Lorentz force (a force resulting from the interaction between a magnetic field and an electric current) to generate thrust. 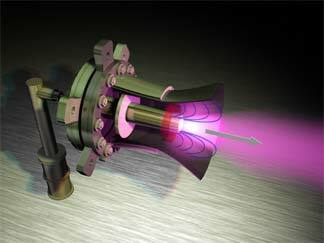 It is sometimes referred to as Lorentz Force Accelerator (LFA) or (mostly in Japan) MPD arcjet. Generally, a gaseous fuel is ionized and fed into an acceleration chamber, where the magnetic and electrical fields are created using a power source. The particles are then propelled by the Lorentz force resulting from the interaction between the current flowing through the plasma and the magnetic field (which is either externally applied, or induced by the current) out through the exhaust chamber. Unlike chemical propulsion, there is no combustion of fuel. As with other electric propulsion variations, both specific impulse and thrust increase with power input, while thrust per watt drops. There are two main types of MPD thrusters, applied-field and self-field. Applied-field thrusters have magnetic rings surrounding the exhaust chamber to produce the magnetic field, while self-field thrusters have a cathode extending through the middle of the chamber. Applied fields are necessary at lower power levels, where self-field configurations are too weak. Various propellants such as xenon, neon, argon, hydrazine, and lithium have been used, with lithium generally being the best performer. In theory, MPD thrusters could produce extremely high specific impulses (Isp) with an exhaust velocity of up to and beyond 110,000 m/s, triple the value of current xenon-based ion thrusters, and about 20 times better than liquid rockets. MPD technology also has the potential for thrust levels of up to 200 newtons (N) (45 lbf), by far the highest for any form of electric propulsion, and nearly as high as many interplanetary chemical rockets. This would allow use of electric propulsion on missions which require quick delta-v maneuvers (such as capturing into orbit around another planet), but with many times greater fuel efficiency. MPD thruster technology has been explored academically, but commercial interest has been low due to several remaining problems. One big problem is that power requirements of the order of hundreds of kilowatts are required for optimum performance. Current interplanetary spacecraft power systems (such as radioisotope thermoelectric generators (RTGs)) and solar arrays are incapable of producing that much power. NASA's Project Prometheus reactor was expected to generate power in the hundreds of kilowatts range but has been discontinued in 2005. A project to produce a space-going nuclear reactor designed to generate 600 kilowatts of electrical power began in 1963 and ran for most of the 1960s in the USSR. It was to power a communication satellite which was in the end not approved . Nuclear reactors supplying kilowatts of electrical power (of the order of ten times more than current RTG power supplies) have been orbited by the USSR: RORSAT ; and TOPAZ . Other problem with MPD technology has been the degradation of cathodes due to evaporation driven by high current densities (in excess of 100 amps/cm^2). The use of lithium and barium propellant mixtures and multi-channel hollow cathodes has been shown in the laboratory to be a promising solution for the cathode erosion problem. Research on MPD thrusters has been carried out in the US, the former Soviet Union, Japan, Germany, and Italy. Experimental prototypes were first flown on Soviet spacecraft and, most recently, in 1996, on the Japanese Space Flyer Unit, which demonstrated the successful operation of a quasi-steady pulsed MPD thruster in space. Research at Moscow Aviation Institute, RKK Energiya, University of Stuttgart, ISAS, Centrospazio, Alta S.p.A.,Osaka University, University of Southern California, Princeton University's Electric Propulsion and Plasma Dynamics Lab (EEPDyL) (where MPD thruster research has continued uninterrupted since 1967), and NASA centers (Jet Propulsion Laboratory and Glenn Research Center), has resolved many problems related to the performance, stability and lifetime of MPD thrusters. An MPD thruster was tested on board the Japanese Space Flyer Unit as part of EPEX (Electric Propulsion EXperiment) that was launched March 18, 1995 and retrieved by space shuttle mission STS-72 January 20, 1996. To date, it is the only operational MPD thruster to have flown in space as a propulsion system.